The Londonderry Basketball Club (LBC) is a private non-profit organization formed to provide the youth of Londonderry an opportunity to learn and play the game of basketball. LBC has been sanctioned by the Town of Londonderry to be responsible to organize, fund and operate both the recreation and travel programs for the town. The overall goal of LBC is to provide an appropriate basketball experience for all levels of ability. We stress sportsmanship, teamwork and enjoyment in both the recreational and travel programs. We receive no direct funding from the Town of Londonderry. The programs, equipment, uniforms and referees are self-funded through tournaments and participation fees. It is our goal to provide instruction and enjoyment to each child and to help them reach their full potential. The Londonderry Basketball Club (LBC) is pleased to announce that registration for the 2017-2018 season is now open. We will be offering programs from 1st grade through high school again this year. Registration is $85 for the season. Make sure you register before the the $10 late fee kicks in on November 16. We are always looking for coaches, assistant coaches, and coordinators so please let us know if you’re interested in these roles during the registration process. The season will begin on Saturday, December 2 and run through mid-March with a double elimination playoff schedule. Please go to www.LBCHoops.org and register online. We look forward to seeing you all on the court very soon! We are excited to announce that we have posted this weekend's LBC Rec Playoff schedule. All divisions (grades 3 and up) will have a single elimination format with initial games on Saturday and championship games on Sunday (Boys High School will also have some semifinal games on Sunday). Exciting for this year: we will hold championship games for Boys 5/6, Boys 7/8, and Girls 7-10 in the Middle School gym! All other divisions will be held at North School. If you feed the LBC calendar into your iPhone, your 1st game should appear. To see the entire set of brackets, navigate as follows: www.LBCHoops.org, All Teams and navigate to your division. Once there, you will see "Brackets" on the left. Click that button and you will see the whole path to the final game. Winners and runners-up will receive trophies in Sunday's final games. While these are the playoffs, please remember that these are youth recreational games and to be respectful of our referees, coaches, and other parents. We are all here to provide a positive, supportive environment for our children and will rely on parents to be role models for proper behavior. It’s that time of year to announce that Londonderry Boys Varsity Basketball Coach Nate Stanton's Summer Basketball Camp for Boys 3rd -10th grade is on the horizon! As Coach Stanton says, the offseason is where players are made! Along with Coach Larosa and select LHS Varsity players their skills will be enhanced with great practice habits to build on in the offseason to help them reach their potential. 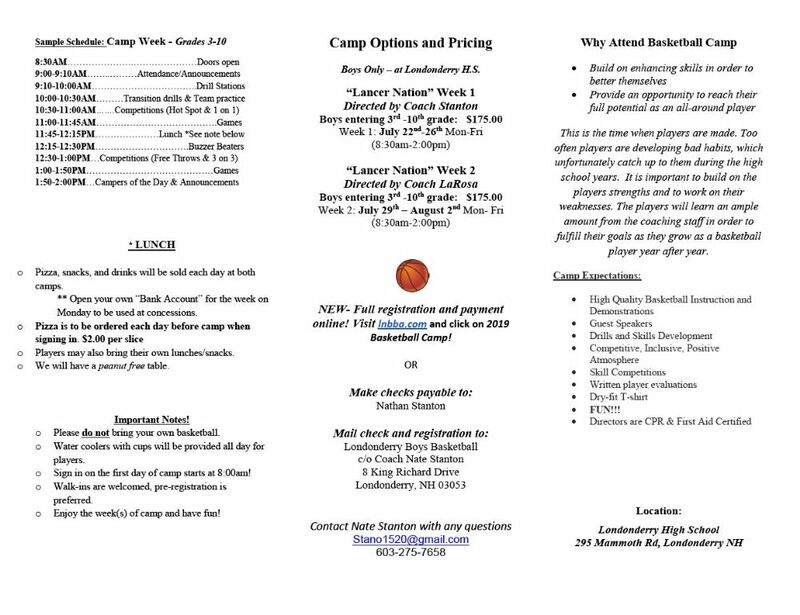 “Lancer Nation” Week 1 for boys Grade 3-10 with LHS Boys Varsity Coach Nate Stanton will be Monday through Friday July 22nd -26th from 8:30 a.m. – 2:00 p.m. at the Londonderry High School. “Lancer Nation” Week 2 for boys Grade 3-10 with LHS Boys JV Coach Alex Larosa will be Monday through Friday July 29th – August 2nd from 8:30 a.m. – 2:00 p.m. at the Londonderry High School. Let’s do great things! See you on the court!